This exquisite small sterling silver Penannular brooch is exquisitely made with a thistle motif on the pin top and on the ends of the hoop. This piece is a finely crafted reproduction of the antique original in high detail in sterling silver. I found this exquisite piece just below Edinburgh Castle in an antique store on the Royal Mile. Size: The round hoop is 1” (25mm) in diameter and the pin is 1-1/2” (39mm) long and 3/8” (10mm) wide. This is a dainty penannular. Celtic jewelry like the Celts themselves has a rich history and a proud tradition. Immensely beautiful with intricate Celtic symbols and delicate designs, Celtic penannular jewelry and Celtic knot jewelry have been admired and desired for thousands of years. 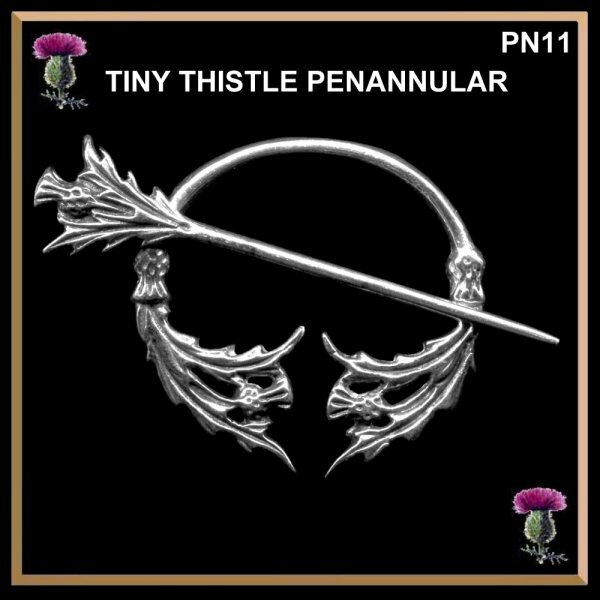 Our Scottish thistle penannular pin is truly a small treasure for all to share.